You can safeguard pictures from accidentally erasing them from your Nikon D7000 by giving them protected status. After you take this step, the camera doesn’t allow you to erase a picture by using either the Delete button or the Delete option on the Playback menu. In single-image view, just display the photo. In 4/9/72 thumbnail mode, use the Multi Selector as needed to place the yellow highlight box over the photo. See the key symbol on the button? That’s your reminder that you use the button to lock a picture. 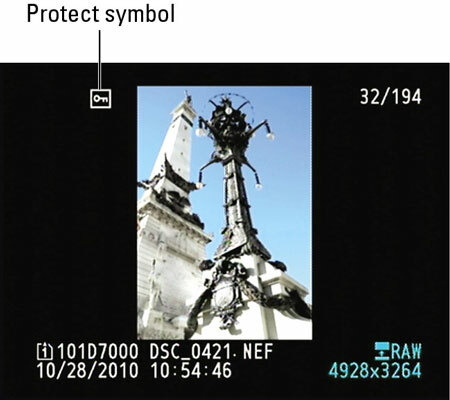 The same symbol appears on protected photos during playback. To remove protection, display or select the image and then press the WB button again.